I love a vacation rental. I will almost always book one over a hotel if I can, because I enjoy having the extra space and a kitchen, so I can make breakfasts and also bring back leftovers. If you enjoy the same things, then a vacation rental might be more for you as well. If you’re headed to southern California and looking to get away from it all, Big Bear has activities for the whole family, or can be just a super relaxing destination that isn’t home. 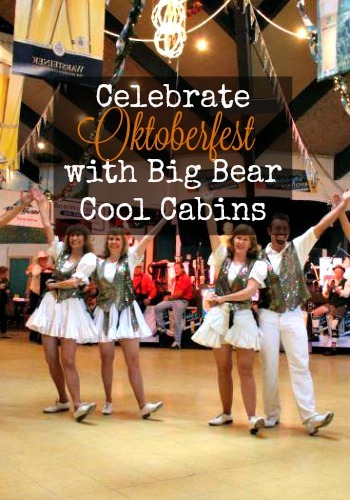 And if you are into that, then check out Big Bear Cool Cabins. They’re your home away from home, but better, because it isn’t home. Ocktoberfest in Big Bear is the #1 rated Oktoberfest in Southern California, and it doesn’t just have beer, but German music, entertainment and food. Enjoy the very same beers poured at Munich’s Oktoberfest for more than 150 years! You’ll be so tired (and full), you’ll just fall into your awesome Cool Cabin bed. That’s the best feeling, in my opinion. Then you can sleep it all off and head home in the morning, or stay longer if you want. It’s all up to you. There are great rentals on special for the Encore promo, from 1 bedrooms that sleep 4 to 7 bedrooms that sleep over 20. Go with your sweetie for a romantic stay or take a whole crew out there to indulge in the celebration. Whoever you bring, you’ll be able to stay affordably and in comfort.